Produced by the former compilers of the Thomas Cook European Rail Timetable (an invaluable reference to travellers for over 140 years), this new version of the European Rail Timetable remains the only concise monthly guide to European rail services. Packed with over 500 pages of rail and ferry schedules for Europe and beyond. A unique must-have for InterRailers and Eurailers, as well as travel agents, independent travellers, libraries and indeed anyone who needs to know about train times throughout Europe. 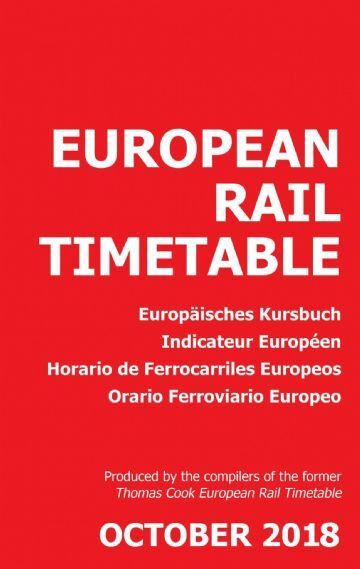 The October edition of the European Rail Timetable includes, in the Beyond Europe section, the latest schedules in Japan, China, South America and South Korea. The Winter International Supplement will be expanded to 40 pages to show advance versions of all the international tables valid from December 9. As well as schedules the European Rail Timetable includes key country information, 23 route maps and 34 station location plans, airport to city-centre links, details of car-carrying trains, suggested scenic rail routes, a Route of the Month (compiled by the editors of Hidden Europe magazine) and a Beyond Europe section covering a different area of the world each month. As well as schedules, the European Rail Timetable includes key country information, 23 route maps and 34 station location plans, airport to city-centre links, details of car-carrying trains and suggested scenic rail routes. To order your personal copy click here.